Redditch Station was formally part of the line known as the Birmingham and Gloucester Loop, which branched off the mainline between Birmingham and Bristol at Barnt Green. The line ran through Redditch and Evesham to rejoin the Bristol line at Ashchurch a distance of 32 ½ miles (52km). The loop line actually built in three separate stages. The first section was the 4 ½ mile Redditch Railway from Barnt Green to Redditch. The Redditch Railway was promoted by a number of businessmen from Redditch and the act of Parliament to allow construction was passed on 23 July 1858. The line had an authorized share capital of £35,000 in £10 shares and was allowed to borrow up to £11,500. The Hon. Robert Windsor Clive MP performed the ceremony of cutting of the first sod on August 5 1858; Construction proceeded with the line opening to passenger on September 19 1859 and to freight on 1st October of the same year. The opening of the line virtually coincided with the first issue of the town’s newspaper, The Redditch Indicator (The indicator newspaper was merged with the Redditch Advertiser Newspaper a number of years ago), on September 24 1859. 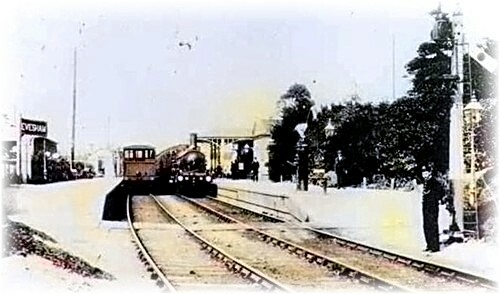 The first public train over the line was an excursion to Cheltenham, which was followed by a dinner at the Unicorn Hotel in Redditch. The Redditch Railway never owned any locomotives of rolling stock of it’s own and the Midland Railway worked the line from the outset. Construction of the second section of the loop line between Ashchurch and Evesham was started following the passing of the act to authorize it on June 7th 1861. This section of the line opened on 1st October 1864 and was operated and promoted by the Midland Railway from the outset. The Redditch and Evesham Railway drew up plans for the third and final section of the loop. Again this was an independent Railway Company backed by the Midland Railway. Authority to build this 17 ¼ mile line was gained on 13 July 1863 and the Company had a share capital of £189,600. Construction started from the Evesham end as the impetus came from Evesham rather than Redditch. 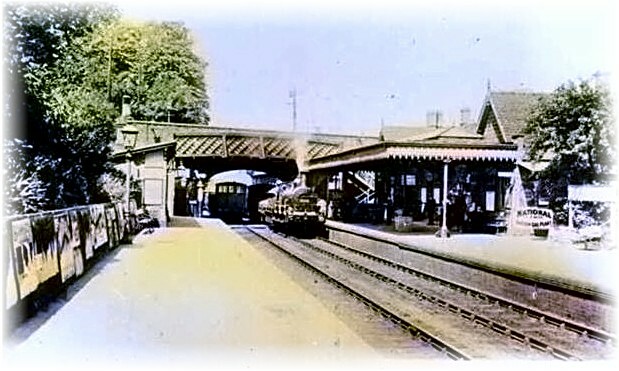 The first 9 ¾ miles from Evesham to Alcester was opened on 16 June 1866 to freight and passengers on 17 September of the same year. Work on the remaining 7 ½ miles from Alcester to Redditch took longer because of the need to construct the 330-yard tunnel under Mount Pleasant in Redditch. The tunnel took 18 mouth to construct because of problems with the sub soil. The whole line was completed on May 4 1868. The whole of the line from Barnt Green to Ashchurch was built to double track standards except for the 330-yard Redditch Tunnel. The only section that had double track was that between Evesham and Ashchurch. At various times during the life of the line schemes have been promoted for the doubling of the line between Redditch and Barnt Green. It was seriously considered during the Second World War when the possibility of a rail connection was looked at for the then new (opened 1939) High Duty Alloys factory to the north of the Redditch alongside Windsor Road. Consideration was also given during the 1970’s when the West Midlands Passenger Transport Authority was looking at the possibility of creating what became the Cross City Rail Line. General freight facilities were withdrawn from Redditch in 1969. The station continued to handle parcels and the freight yard was home to a rail fed stone terminal during the 1970's and early 1980's. This stone was required for the construction of the Redditch New Town and was closed following the completion of the M42 motorway.